Health and Entrepreneurship. Our curriculum can also be used for MATH and SCIENCE LABS. ReBuildUp’s name comes from the phrase “Startups Rebuild Economies.” Based in Greensboro, North Carolina, our company’s mission is to help create a community’s ‘farm team’ of healthy future entrepreneurs. After all, more companies mean more economic growth. Founded March 1st, 2014, we started out offering only financial literacy games. Our first year saw ReBuildUp’s games played by over 500 participants, many of them inner city youth, in over 37 events throughout the Greensboro-Triad region of North Carolina. We had our 50th event on August, 29th, 2015. Going forward, we’ve included the topic of health as we work more with schools. Now entering Year 4, we’re finding growing success with our decision to combine our Entrepreneur Program with our Health Program forming the Food Growing League (FGL). 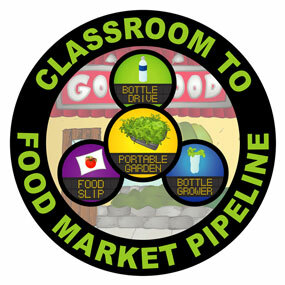 The FGL has students in class grow different vegetables, fruits, herbs, and spices for monthly harvests. The growing techniques used are simple and can be replicated at home even for those living in apartments. The top harvest weights from each class go head to head with other schools to see who grew the most each month according to Monthly Score Cards documenting the scores and rankings. This info can be used to help students practice the latest MATH and SCIENCE lessons they’ve been learning in class. We work with schools, businesses, and community organizations to develop & deliver programs to better the lives of young and old. What are you looking to teach students in a new way? What community problems are you trying to solve? Contact us and we’ll work to come up with the solution.